Thank you for the rock-solid shed you finished for me today. I am very, very impressed. I used to work in construction myself back in the late 70s, building houses working for others, then I formed my own construction company and had my own crew, so I like to think I know a little bit about construction. You, your company, your crew, and your finished product are the very best in professionalism, rock solid approach and completion, and much more. My 12x32 lofted barn shed has a ton of storage (a whopping 768 square feet!) and is built so nicely that it greatly compliments this only-5-year-old well-built house. Now my wheelers and other outdoor toys can live indoors, and I even get to park in my own garage for a change! You did everything you said you were going to, and did it sooner than the initial estimate, which was great for me. I was so surprised when I saw how fast and well you built it, and you really surprised me with your design of that extra loft door we talked about - by making that opening with 6 sides instead of 4 you provided me with a much larger opening to access the loft, and it really looks fancy-schmancy. I also love the extra-thick plywood you use, and the built-in workbench and shelving. I'm sending you pictures of what you've done here; feel free to use them on your web site or advertising or whatever you want. 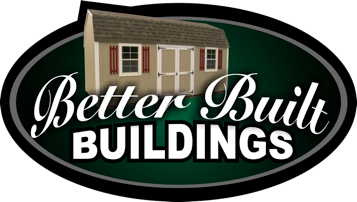 Do you like your Better Built Shed? Let us know. We love to hear from our Customers. I had Galen come out today just to talk, walk and look. Couple of hours later he is unloading our new shed! 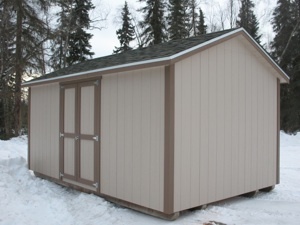 It is only 12 x 20 (portable garage), but once it was opened up my jaw hit the dirt! You guys know what y’all are doing! I posted pics on facebook, but not of what I put inside of it yet until it gets an alarm zone thru our system. Galen and the other guy who came to help off-load it. I got 1 word for these 2 guys- AWESOME. Very professional, accurate, I was impressed (and let me tell you it takes a LOT to impress me!) I had my 2 trailers moved before the better half even got home! And was filling that sucker up. I already have friends asking where we got the shed. Hopefully can get some more folks interested, all I have been able to do is brag about yall! I am completely satisfied with my garden shed. I had my own window, and they were happy to use it in the shed. I also opted for unpainted so I could paint it to match my cabin. I like it so much, I plan on ordering another one this summer. Thanks for the good work!